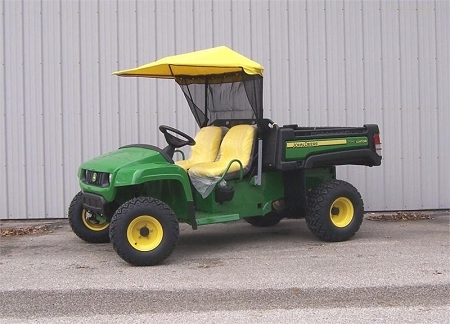 Original Tractor Cab 2010 and Newer John Deere T Series 4x2 Gator Sunshade with deluxe cargo box/bed. 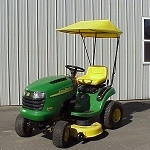 Brand new Vinyl Sunshade that will fit the John Deere 2010 and newer T Series 4x2 Gator Utility Vehicles with the "Deluxe Cargo Box/bed". 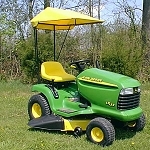 Sunshade features a black mesh rear screen to keep the sun off your back while operating the gator. The sunshade frame is made from durable 16 gauge tubular steel. Vinyl cover is made from extremely tough yet lightweight ripstop vinyl that is resistant to water, fire, mildew and rot. Will not Fit 6X4 Models or Steel cargo box/bed.